I'm really glad I saved some recipes and photographs from last week, because I haven't really cooked much this week at all: making a sandwich and microwaving frozen Brussels Sprouts doesn't count as cooking in my book. 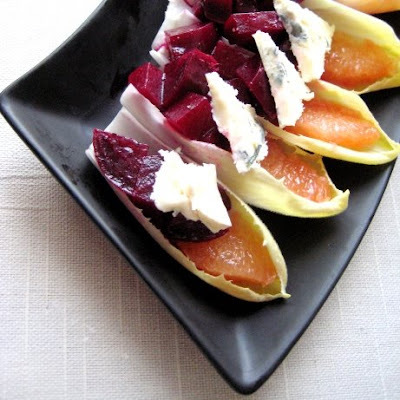 Here is a recipe I came up with for Beet, Endive, Grapefruit & Blue Cheese Salad. 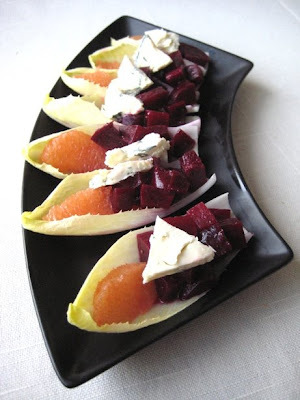 It is similar to the Beet, Orange and Blue Cheese Salad I've made in the past, but has an additional fresh and slightly bitter flavor of an endive. I decided to make this a composed salad instead of mixing all ingredients together because beets tend to color everything making the presentation less than pleasing. And a lot of you loved this black plate when I used it to display pot stickers, so here it is again. I had this salad for dinner last week before going dancing, but you can serve it as an appetizer or first course at your next party. Just make sure to put it together the last minute (although you can have everything cut up and the dressing made and kept separately in the refrigerator for a few hours). The amounts below serve one hungry girl. 1. 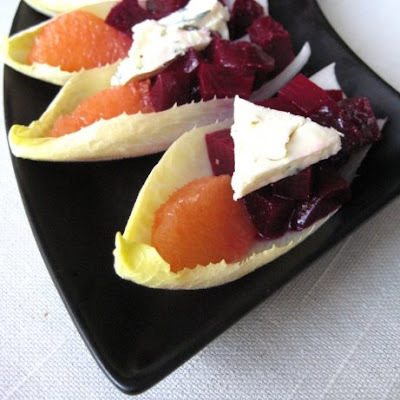 On a plate set endive "boats," top them with a grapefruit segment and a tablespoon of cubed beets. 2. Whisk together raspberry vinegar, olive oil, grapefruit juice and season with salt & pepper to taste. 3. Drizzle the dressing over the grapefruit and beets and top your creation with a wedge of blue cheese. 4. Eat immediately (or at least as soon as you take the photograph!). this is SO creative and the presentation looks straight out of a restaurant! I love the presentation! It looks so elegant! So summery, refreshing and colorful salad! What an incredible presentation. Years ago a beet and endive salad was all the rage. This looks like an improvement on a golden oldie. 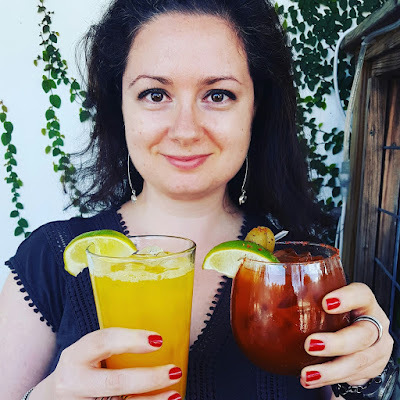 This is very nice, Olga. Endive is a perfect snacking vessel, huh? This sounds really good...sweet, tart creamy. Gorgeous and perfect presentation. Good for entertaining! This looks great-such an unlikely combination. Beets are awesome and in my opinion taken for granted, too. I love salads as this or these are lovely appetizers!! Olga, I made your eggs in a whole with spelt bread & it was so lovely! Surely I will make it again! very pretty creation. Love the combination of colors and flavors! This is gorgeous! I love the presentation in the endives! Delicious combination too! I love salad when it is in this shape then i cant stop my self. Looks delicious and so creative..